The battle between classes has been the source of conflict for so many great British stories (both literature and film). And in terms of comedy, has class warfare ever been made into a blacker or more sublime comedy than this? Louis Mazzini (Price) is the runt of the noble D’Ascoyne family, a man whose mother married ‘beneath her’ and was thus shunned and excised from the family and their fortune. After the shameful treatment of her mother upon her untimely death, Mazzini makes it his life’s ambition to kill everyone in the snobbish family and assert his right and title within the family. It’s a heinous plot of eight first degree murders plotted for years, but when told with such gentlemanly class and articulation, the acts seems like jolly good fun instead of horrific violence. We get to see each act of murder, conceived in the most creative ways by Mazzini to look like accidents. Since this whole farce is told to us through voiceover on the day before Mazzini is due to be executed for murder, we know it ends badly for the man. But the fun here is the journey of sweet revenge, which is served extra cold by director Robert Hamer. It’s easy to see why Louis hates the family so maliciously. The smug gentlemanly spitefulness of the twit-ish D’Ascoyne family is laid on so thick, we just want to smack the many faces of Alec Guinness with a spanner or throw him under a lorry. Guinness, who famously played eights members of the D’Ascoyne family in heavy but unobtrusive makeup, is deservedly lauded. This performance came long before Peter Sellers did the trick three times in Dr. Strangelove and most certainly before Eddie Murphy did it in Coming to America and the Klumps movies. 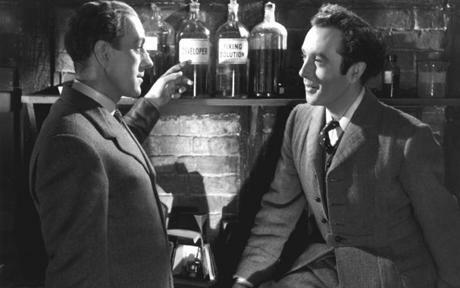 Dennis Price is much lesser known than Guinness, but his overly gentlemanly and polite persona perfectly disarms us to the grisly acts of murder he commits. If anything, the film suffers on the over reliance of Mazzini’s narration. There’s probably more words from the narrator than any other character in the movie. Practically everything in Mazzini’s mind is told to us from his confession in the present. But considering the complex and ambitious plotting, as well as the time period spanning several years and encompassing several characters whom we meet only for brief seconds, there’s really no other way to pass along such information without filling the dialogue with dull exposition. It's also comedy, so we don't mind forgiving this crutch. In the end, Mazzini succumbs to his own sword. In his desire to be included in nobility and assume his birthright, he comes to embody the same bloodsucking entitlement he condemned in his victims. The irony and drollness of these affairs is the stuff of classic British class-comedies – the same kind of humour Alfred Hitchcock honed for decades in his blackest comedies.